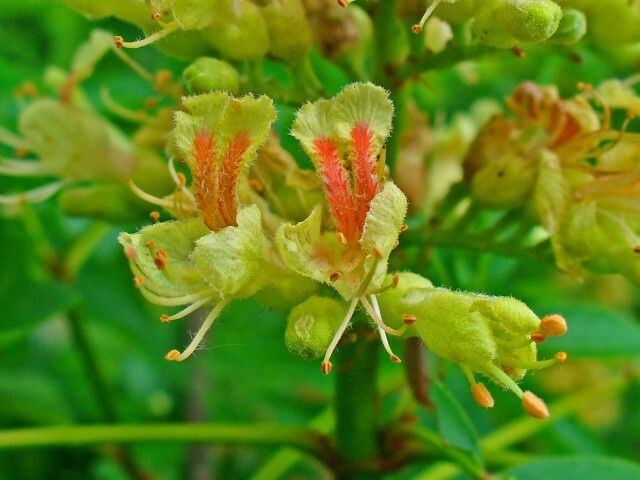 Flowers of the Ohio buckeye (Aesculus glabra). Photo by H. Zell/Wikimedia Commons. Spring-blooming horse chestnuts and buckeyes (Aesculus) are prized for their handsome foliage, showy flowers, and shiny conkers. Some boast gorgeous fall colors, too. The Arboretum collection currently features 81 trees and shrubs, comprising 12 straight species and 12 hybrids, varieties and cultivars. Some of our common horse chestnut (Aesculus hippocastanum) specimens may date back to the Olmsted “Boulevard Era” (1903–1933), prior to the founding of the Arboretum. In the latest Arboretum Bulletin, Director Emeritus John A. Wott proflies some of his favorite Aesculus in the park. ← A Fabulous Earth Day Event!